What languages do you speak at Glendale Healthcare Center? Yes, we have beauty and barber shop services at the facility. We also offer manicures and pedicures. Prices and times for these services are provided at the front desk. Yes, we have flat screen televisions in every room. Will there be Cable TV available? We offer access to cable TV for all residents in their rooms at no additional fee. There are cordless phones available for all residents at the nurses’ stations. Yes, we offer Internet WiFi. Please contact our front desk for details. 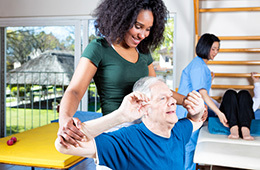 Our rehab director can inform you of the rehabilitation program designed for your loved one.